War prisoner, farther, optometrist… time traveller, these are the different roles of Billy Pilgrim’s life. Captured during the Battle of the Bulge, towards the latter stages of World War II, Billy, a less than heroic Chaplain’s Assistant, ends up with his fellow prisoners in a disused slaughterhouse in Dresden, where they hide out and survive the horrific Dresden Bombing that took the lives of over 25,000 people. Some years later, Billy, now a successful optometrist, is abducted by the Tralfamadorians, a superior race which takes him to their planet and put him on show in the zoo, forced to live and mate with the famous model and actress Montana Wildhack. The Tralfamadorians teach Billy about how time is not a continuous motion forward, but each moment continues to exist forever and can be enjoyed at any time. The book follows this line of thinking jumping through Billy’s time line, looking at the war, his abduction and all the major events in his life. 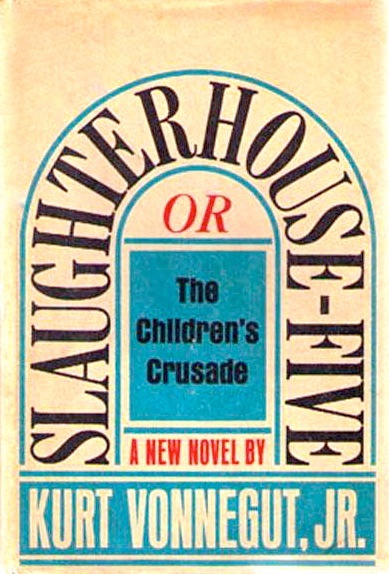 Bitter yet funny, ludicrous yet chillingly real, Slaughterhouse 5 is a moving anti-war novel, a stark examination of the human psyche and even a completely original piece of fantasy fiction. The writing is sharp and powerful, the characters are incredibly real and the ideas that surround this real event are incredibly original. Do not expect a tangent, coherent piece of literature with a clear beginning, middle and end because you definitely won’t get it here. There is no definitive conclusion, no heroic crescendo, just an excellent piece of writing that definitely deserves to be on the list of 1001 Books to Read Before You Die. I prefer Cat’s Cradle — a more satirical work for sure…. Ridiculing many of the excesses of sci-fi… and other themes as well. Love both this and Cat’s Cradle – two brilliant pieces of writing that I think everybody should read. 1001bookstoreadbeforeyoudie · Lets hope you live for a long time!